People who stand for long periods of time each day often experience foot and leg pain, stiffening of knee joints, and even lower back, shoulder and neck pain. They tend to feel tired and less energetic at the end of the day, making it more difficult for them to join in activities with family and friends. In addition, studies have shown that standing for long periods on hard floors such as concrete or tile can cause swelling of the feet and legs as well as circulation difficulties some of which can be permanent. In such cases, anti-fatigue mats have been known to make standing for those periods of time more comfortable for most people. An anti-fatigue mat is an ergonomic floor mat that is specifically designed to provide a cushion between your feet and the floor. There are several different types of anti-fatigue mats ranging from those that are simply made from thick rubber or rubber like material to those filled with foam or gel. Anti-Fatigue mats come in a variety of thickness and are meant to soften the pressure on your feet and legs caused by hard floors. People who use such mats find that a good quality mat can help reduce soreness of the feet and legs, reduce stiffness in ankle and knee joints and relieve back pain. What Are Anti-Fatigue Mats Made of? 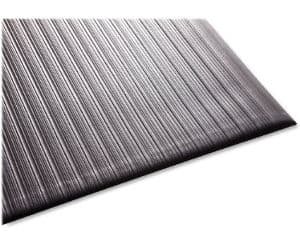 There is a wide variety of materials that are used in anti-fatigue mats including cloth, vinyl, rubber, foam and gel. Most of these mats consist of three layers of material. The two outside layers are made from an easy to clean material and the inside is filled with some type of cushioning material to provide additional comfort. Being able to stand for longer periods of time: People who use those mats find that they are able to stand in one spot for longer periods of time without needing to take a break since these products help to reduce foot, leg and back pain. Increased Productiveness: By experiencing less discomfort, most users find that their productiveness is greatly improved because they are able to concentrate on their work without feeling tired or worrying about pain. 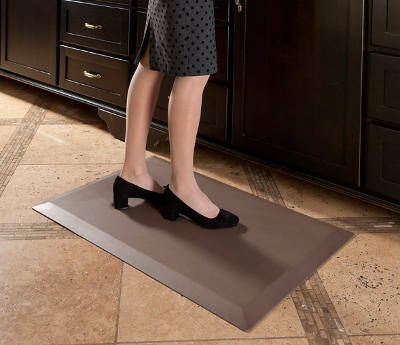 Reduction of Risk of Circulation Problems: Anti-fatigue mats reduce the risk of circulation problems in people who must stand in one place for a long period of time. These mats also have the added benefit of reducing swelling in the legs, ankles and feet. Now that you know how anti-fatigue mats can help to improve your overall health and well-being, here is a look at some of the best anti-fatigue mats available on the market today. The Crown Comfort King Anti-Fatigue Mat comes in two sizes, 24” X 36” and 36”X 60”. It is made from high elastic components that are said to be 3 times more resilient than vinyl foam. This mat is 3/8 of an inch thick. It only comes in royal blue and is shaped like an envelope with the flat open. Users do find that using this product is much better than standing on a hard floor or using an area rug. Although few of them feel that the mat could be thicker, they state that it does provide some relief for aching feet over extended periods of time. The Sky Mat Anti-Fatigue Floor Mat is available in two different sizes: 20” x 39” x 3/4” as well as 24″ x 70″ x 3/4″. It is made of eco-friendly material and comes with a lifetime warranty. It comes in two colors, one is midnight black and the other is dark maple brown. It also has low angle beveled edges and an ultra grip technology to prevent tripping when walking over the mat. Users find that it is exceptionally easy to clean by simply wiping it off and that it stays in place on the floor. They also state that it is comfortable on their feet, relieves knee and back pain and leaves them feeling less exhausted at the end of the day. The Genuine Joe Anti-Fatigue Mat can be purchased in packages of either one or two mats. Each mat is 3/8 inches thick and is made from vinyl foam structure with a ribbed surface that can reduce fatigue and prevent slipping. Users say that it is stable and easier on their feet when standing than simple carpeting or area rugs. It is durable and easy to clean as well. However, some people mentioned that they would like it to be somewhat thicker so that increased thickness would further help to reduce leg and back pain. 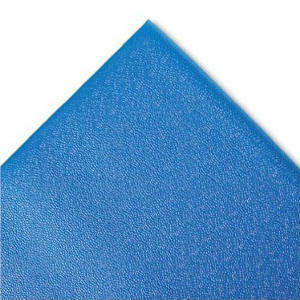 This NoTrax 410 PVC Airug Anti-Fatigue Mat comes in assorted lengths and widths, and is about 3/8 of an inch thick. You have a choice of three colors black, gray, or black/yellow. It is made of PVC closed cell foam and has a ribbed design to help prevent slipping. Its beveled edges help hold the mat to the floor and prevent tripping. While users do think that this product allows them to stand for longer periods of time without leg or knee fatigue and is extremely easy to wipe clean, they also feel that it needs to be somewhat thicker for long periods of standing in one place. 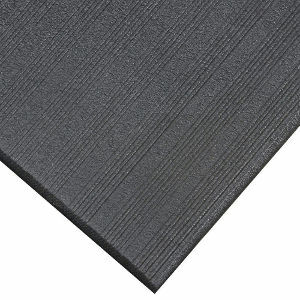 The CumulusPro Commercial Anti-Fatigue Mat measures 24 X 36 inches and is a full ¾ of an inch thick. It comes in several patterns and some nice bright colors as well as plain black and brown. This mat is made up of non-toxic and phthalate free material and has contoured beveled edges. It also comes with a 10 year warranty. 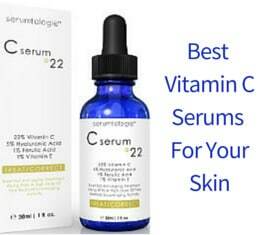 Users find it to be of a high quality and extremely durable. It is easy to clean and has a very cushioned feel when standing on it. 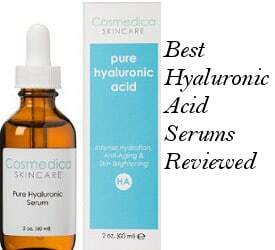 People also say that this is an expensive product, but it is well worth the high price tag. This NewLife GelPro Comfort Mat comes in two sizes, 20X32 inches or 20X48 inches and is ¾ of an inch thick with beveled edges. 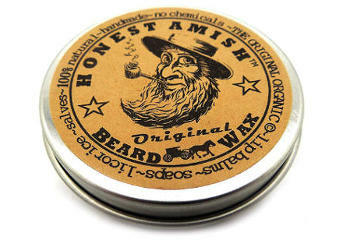 It is stain resistant, comes in a handful of colors and is made in the USA. While some users feel that this mat looks cheap or at least less than attractive, they state it is solidly constructed. It is easy to wipe clean and does provide good cushioning for the feet. However, few users have complained about its edges curling and mention that it shows signs of wear within a year of use. The Imprint Cumulus9 Nantucket Comfort Mat comes in a variety of sizes, colors and patterns and is 5/8 inches thick. It is made from non-toxic and phthalate free material that is both anti-microbial and stain resistant. It wipes clean with just soap and water, and the edges of this mat won’t curl. Most users report that their feet instantly feel good the moment they step onto this mat and that they find it relieves back and leg fatigue. 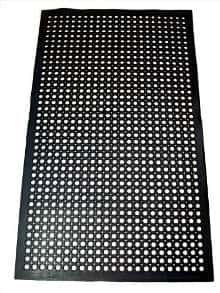 This New Star Anti-Fatigue Mat is often used for commercial applications to provide relief from fatigue to employees who must spend a good deal of time standing while doing their jobs. Made of durable rubber, this mat is 3 feet by 5 feet and about 3/8 of inch thick with holes throughout to allow drainage in damp areas. Some users comment on the fact that when new, this product has a strong rubber smell. However, they think it is great in areas where slipping is a problem and they support it does provide cushioning for the feet, legs and back. Anti-Fatigue mats can allow you to stand for longer periods of time without suffering discomfort in the feet, ankles, legs, knees, back and shoulders. Finding the best mat to suit your needs can actually be a real relief and help you feel less tired and more energetic.